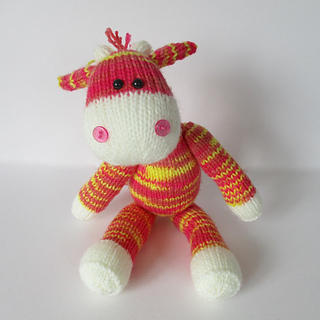 The giraffe is approximately 33cm tall (standing, from tips of toes to top of horns). 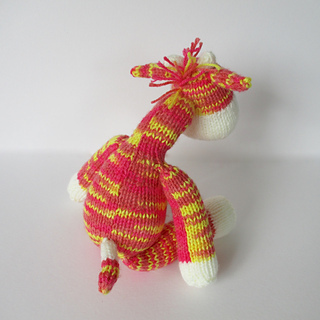 Gerald is a cuddly giraffe, and he is knitted in a multi-colour (or variegated) yarn to make a colourful body pattern without any tricky colour-work. 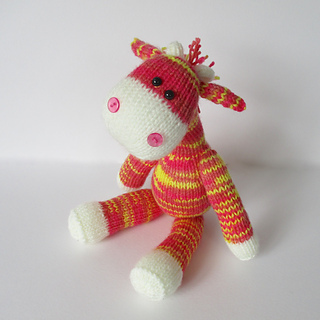 THE PATTERN INCLUDES: Row numbers for each step so you don’t lose your place, instructions for making the giraffe plus photos, a list of abbreviations and explanation of some techniques, a materials list and recommended yarns. The pattern is 4 pages and written in English. 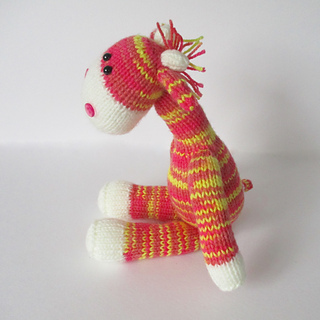 TECHNIQUES: All pieces are knitted flat (back and forth) on a pair of straight knitting needles. You will also need to cast on and off, knit, purl, work increases and decreases, and sew seams.